After a two-hour drive up the sunny California coastline, I found myself ready to stride towards the 18th Annual Los Angeles Times Festival of Books. The two-day event (April 20th and 21st to be exact) had about 150,000 other literary lovers roaming around USC’s campus in search of panels, readings, cooking demonstrations, food trucks, local music, and (of course) visiting the hundreds of exhibitors to add books to their libraries. Once I gained my footing, I drifted away from the hustle and bustle of the fair to settle into the shady grass surrounding the poetry stage. Although the stage had twenty-something white (and I’m sure comfortable) fold-out chairs available, many audience members decided to keep their distance and bend their necks towards their notebooks to steal a line or two from the performing poet. 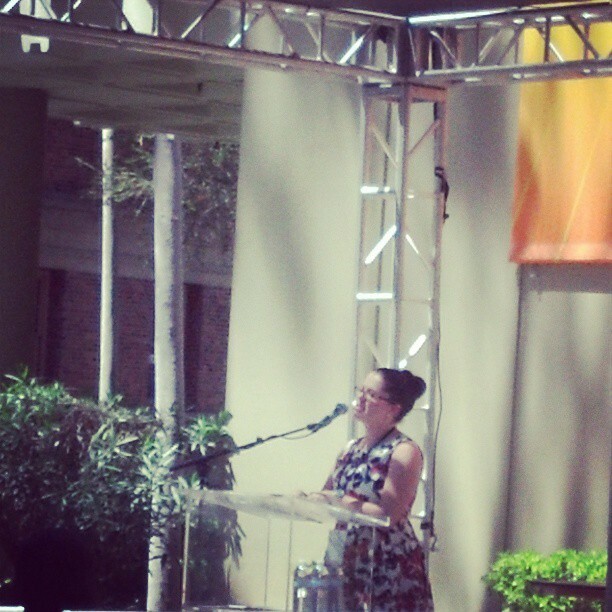 The stage had a single podium where poet/moderator Elena Karina Byrne would introduce the upcoming poets. I specifically came out to hear the dynamic-touring duo of Brynn Saito and Traci Brimhall, whom I had the pleasure of listening and conversing with only days before. Traci Brimhall quickly stepped up to praise the weather and rejoice not being in Michigan, where it snowed heavily the day before. Brimhall introduced her Barnard Women Poets Prize-winning second collection, Our Lady of the Ruins, as an exploration of an imagined history of women traveling in a mid-apocalyptic landscape. The poems sparked with multiple voices exploring the landscape of a “Labyrinth” or telling lessons to one speaker’s unborn daughter. Brimhall was truly present in her work as she offered anecdotes regarding each poem. “It’s like you guys are receiving the live album version of the collection,” Brimhall celebrated, “and because we get to share this experience together, you deserve a secret.” Before reading her last poem, “Jubilee,” Brimhall confided that her grandmother has been predicting the apocalypse for years, and she believed it would happen in an odd seventh year (hence, why the collection is divided into seven sections of seven poems per section!). Brimhall’s remarks regarding readings as an experience are spot-on. I was able to witness books coming alive everywhere I went as they were read aloud and passed around deep into the evening. Although my own book bag was empty, I made my way back to my car with my head brimming, heavily listening to everyone around me. All of us were eager to arrive home, switch on our nightstand lamps, and pull a good book into our covers not just that night, but for many nights to come. Can’t wait for next year or just want to know more? Check out the Los Angeles Times Festival of Books. Want to see Brynn Saito read? Come to her reading at San Diego’s Upstart Crow on Wednesday, May 15th! For more information on Brynn Saito, click here. For more information on Traci Brimhall, click here. 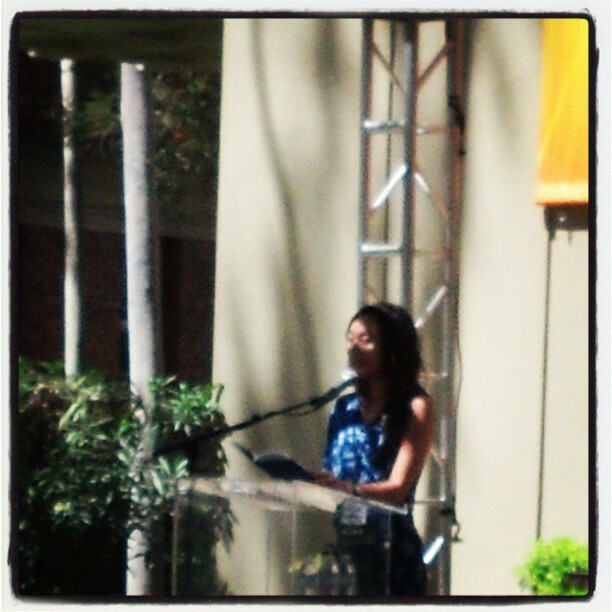 Tags: Brynn Saito, Festival of Books, Los Angeles Times, poetry, reading, Traci Brimhall. Bookmark the permalink.